Much of the mail that I receive here at HaigWhisky.com is related to people from all over the world who have found or been bequeathed an old bottle of Haig Whisky and Haig Dimple and Haig Pinch in particular. When you remember that up to about 40 years ago, Haig Whisky was one of the most popular Scotch whiskies in the world it goes some way to explaining why so many bottles of Haig were given as special presents or gifts for significant birthdays or family events. It was probably their sentimental value that prevented them from being opened and consumed. You must also remember that we now live in a consumer age where no one thinks twice about ordering a bottle or two of Scotch Whisky online or buying Scotch in your local store. But 40 to 100 years ago, a bottle of Scotch was a once a year purchase and quite unusual and special for the average family. This, I believe is why so many old bottles have still survived unopened. As you may have noticed from my own blog articles, I’m a firm believer that whisky is there to be drunk rather than stored. My advice always is that if you find yourself in possession of a very special bottle of whisky drink it over a year or so on special occasions and then keep the empty bottle as a nice reminder of the original gift and story and also the special occasions when you drank really special whisky. Is Old Haig Whisky Safe to Drink? I’m afraid that I can’t answer that as there are so many variables. Contrary to popular belief, Whisky (unlike wine) does not age in the bottle. Whisky bottles should be stored vertically in order to minimize loss of spirit through seepage or evaporation. Once the seal has been broken and the cork or cap opened, you never have as good a seal again. Part used bottles also have more of the whisky in contact with air which leads to increased evaporation and also oxidisation which will give the whisky a bitter or often metallic taste. Bottles of whisky stored unopened for more than 15 years do deteriorate in quality. Are they safe to drink? Probably yes, but they may not taste nice. The risk is yours. Also beware that whisky bottles left in old attics or cellars may have been subject to contamination by mice, rate etc. which could pose a significant health hazard. As always, use your own common sense. How Much is Your Bottle of Haig Whisky Worth? This is the question I am most asked and 9 times out of 10, I’m afraid the results are disappointing. A bottle of 1940’s Haig Dimple or Pinch with good provenance and with bottle, contents and packaging in good condition may fetch £200 in from a dealer. But! the dealer will only offer you £50 to £80. add in shipping costs and your time and …. Well, no one (usually) gets rich from old bottles of Haig Whisky.Empty bottles and pewter decanters will generally make from £10 to £50. How Old is Your Bottle of Haig Whisky? Having said all that, I’ve decided to spend some time developing a simple user guide to working out how old your old bottle of Haig Whisky might be. I’ll edit and refine this article over the next few months and would also welcome feedback from other Scotch and Haig experts using the comments feature below. You can also check out the infographic below to get an idea of how old your Haig whisky bottle is. Here goes! What Kind of Haig Whisky have you got? Generally speaking there are three types of Haig Whisky. Haig Gold Blended Whisky is in a normal shaped bottle whereas Haig Dimple and it’s American Market sister Haig Pinch are in the three sided bottles with dimples or dents in each of the three faces. Below you’ll see some of the elements of different Haig bottles that can be used to help give a better idea of the age of your Haig bottle. This guide to aging Haig Whisky isn’t definitive but should serve as a good starting point for you and will be added to in time. The Royal Coat of Arms – All bottles of Haig will carry a representation of the British Royal Family Coat of Arms and will mention the King or Queen reigning at time of bottling. This will give you a general idea of the age. The Foil Cap – Foil Caps were in Gold after 1957. Before then they were generally in white but also occasionally in black, brown, silver and gold. Bottles from 1943 to 1946 had no foil caps because all aluminium was required for the war effort and even after the war, the new foil caps were shorter than before. Metal Twist caps – Metal Twist Caps were introduced to Haig Gold bottles in the 1960’s and were replaced with plastic caps in the 1970’s. Spring Cap – The famous spring cap associated with Haig Dimple (first made in 1897) was introduced in the 1920’s. Stamped/Molded Bottle – If the bottle has “Dimple” or “Pinch” stamped or molded into the glass of the bottle than it was bottled before 1954. If the label has both Edinburgh and Markinch mentioned then you may have an unusual bottle! Haig Whisky became a Limited company in 1894 with registered offices in Edinburgh. With expansion of the Markinch production facility after World War 2, the registered offices were moved there in 1952 and thereafter, bottles carried just Markinch on the label. Haig Whisky bottled during the transition period during the build of the new HQ between 1950 and late 1952 carried both place names. And finally, if you bottle comes with a box, it probably dates from after the late 1920 as prior to this Haig Whisky bottles were shipped in straw packed wooden boxes. Nine out of ten inquiries received here about age, value and safety can actually be answered from the information above!! Found this unopened bottle in my parents’ house. Doesn’t have name of monarch. Scotland in glass on bottle. Do you have an idea of what this bottle is worth? Thank you. I have this old empty bottle that just says Haigs. It has a silver top and silver filigree running down the 3 corners, the top of the bottle and the bottom. I don’t know what to ask for it. Hello, I have a bottle of 1951 Haig and Haig scotch whisky unopened and still in the box , can you tell me an approximate value as I’m trying to decide wether to drink it or not. Thanks. Hi Stuart. I’ve been searching thru many photos with no luck matching this bottle to anything and given it has to cap or lid I haven’t been able to ascertain what age it may be. Do you know by chance? My unopened bottle has a spring wire top and reading through this site it looks like it’s dating c1952/54. I would love to know for sure. Struggling to add a picture unfortunately but could email instead. I believe I have a very interesting and quite rare bottle of haig dimple, dating from 1917. unbroken seal with box (bit tatty), no wire due to the war effort. letter from the king to verify this. box is stamped 11/17. could you please advise on value and will it increase in 2017 when it reaches the 100 year mark. thanks for you time. Can you please tell me about old bottle of scotch. I do believe the bottle cap is from the 1920’s. Family heirloom from what I was told it is from the 1940’s. If you have an interest please contact me. Around 1985, although I was already drinking the regular 15 year old Pinch, while in NY a bartender asked if I would like to try a 21 year old Pinch. I jumped at the opportunity and very much enjoyed my drink. Upon returning home, I spoke with my liquor store owner and requested he locate a case for me. Ultimately he obtained a case which were bottles from the Pewter Decanter Series (felt lined, blue box) and cost about 50-70% more than the regular 15 year old. Over the years, I have shared my stash with good friends and one bottle has still survived. When I sip my remaining jewel, it seems much more oakie then I remember from years ago. My questions are; 1) I don’t see any 21 year old Pinch being offered, and no age is maked on the bottle, does a 21 year exist, or was I sold a dream? and, Has my taste memory, and or scotch, deteriorated, or both? Your comments will be appreciated. Thank you. Found a bottle today in my mom’s basement, any idea what year, value and is it drinkable? Hi Stuart, I just brought this bottle home from Germany from my father-in-law’s basement. I cannot figure out how old it is. I’m assuming fairly recent since the box has a barcode and a recycling logo. I would still like to know something about it though. Thank you. Building a wine cellar in a families resort and found this in the wall behind some cabinets. Based upin your notes this probably is 1920-30’s? Hi Donna, Many thanks for moving your inquiry from Twitter over to here. Your bottle is quite interesting and unusual. It’s a bottle of Haig Dimple Sovereign 21 Year Old Whisky in a commemorative pewter decanter. Haig Dimple was sold in the UK market and a slightly different variant Haig Pinch was sold on the US market. These were produced in the 1980s by Haig Whisky to “commemorate” the Union of the Crowns in 1607 of England and Scotland under a single King who was King James 6 of Scotland / King James 1 of England. The coins on the bottles show the cross of St Andrew for Scotland and the Unicorn of England surmounted by a mish mash of the “United Kingdom” Royal coat of arms (Lion and Unicorn) with the crosses of St George for England and St Andrew for Scotland. The D R S logo above this stands for Dimple Royal Sovereign and is a “homage” to the British Royal Ciphers such as the current E II R for Elizabeth 2 Regina. It’s all makey-up marketing stuff and I can think of no reason at all why it should have been commemorated in the 1980’s other than a Whiskey Marketing executive thought it was a good idea at the time. The whisky itself should be quite nice as it is a blend of Scotch Malt and Single Grain whiskies, probably from Glenkichnie, Linkwood and Camoronbridge Distillerys. As you can see from the “Certificate of Authenticity” many thousands were made and even today, they are uncommon rather than rare. The certificate, while it looks impressive was just another marketing gimmick. However, the serial numbering would have been authentic. The decanter is made from Pewter by Royal Holland Pewter who were a Dutch based company famous for their decorative pewter including several Haig pewter decanters. As far as I know, they closed down their pewter operation in the 90’s and moved into making heating boilers. Store it upright in a cool, dry, dark place to ensure the packaging and whisky endure. The coins can fall off in time if exposed to heat, damp or repetitive hot – cold temperature cycles. Value wise? At least €200 to €300 in the good condition that yours seems to be in. However, I have seen these change hands at auction for up to €1,000 4 or 5 years ago. It’s all about meeting the right buyer at the right time. If it was mine, I would not let it go for less than €500. As you will see from my other posts here, a dealer will only offer you 25% to 30% of the selling price. If you want to sell it, put it up on e-Bay etc. for the best results. If anyone else can add to this please join in. Donna, could you take some good quality (Iphone or similar will be fine) pictures of one of the coins and the certificate and add them here as two separate replies to this thread? The certificate on your picture is unreadable in current format and it would be interesting for everyone to see it clearly to see if we are on the right track. I might actually do a separate article on HaigWhisky.com about this Haig Dimple Sovereign release. Just found this bottle in my Grandfather’s house — no indication of the reigning king/queen under the royal coat of arms. It has a plastic cap, with a seal made of the same material as the labels. The label on the back says “Sole USA distributors, Renfield Importers LTD, New York, NY. blended and bottled by Haig & Haig, Markinch Scotland, 100% scotch whiskies”. Any idea how old this is? Hi Stuart. I found a bottle of 12 years old Dimple in my parents cellar. Can you tell me if this bottle is from the 70’s? What is app. value of this bottle. I have read your answer to others with similar bottles but this is a different variant. Will appreciate your answer. Hi Stuart. I found this old Dimple in my parents cellar. They bought in on an European trip at some time many years ago. I have read you answer to Rae and others, but would you please tell me if this bottle is from the 70’s? And app. what is the value? I have a boxed bottle of Dimple Whisky that I donated to a Care Home for them to include in a raffle. The box is marked 6/6/14, so the Home wouldn’t accept it as they thought it was out of date Could someone tell me what the date refers to please ? Could you be kind enough to advise on this Haig bottle from around the 60’s bought at the Skyway Hotels Duty free at London Airport. I have close up pics if you wish. I have this bottle for sometime found in my parents cabinet. It must have been purchased around end 1960’s at “Skyway Hotels the Duty Free shop at London Airport”. It is an export bottle. Could you please shed some light on such bottle. I have more pics but your website allows to upload only one pic. Let me know how to send you close up pics if you wish. What’s your thoughts about this one? Tried to post earlier but not sure if it worked, so will try again. Pictured are the Haig Dimples which were my in-laws. The larger ones all have the copper measures but the tiny miniature does not. As you can see from the photo the miniature has the spring cap, as do the others, all sealed. There is a number 8 on the base of the larger ones. My in-laws always insisted they were worth something. Hi, any idea what these are worth and what age they are. I thought maybe 1950’s. We have an unopened bottle of Pinch whiskey. We do not know exactly how old it is. It came in a golden triangle box with the words Pinch by Haig & Haig written on all three sides. There is a red seal with a coat of arms at the top of the box. The words: “Blended Scotch Whiskey 100% Scotch Whiskies 4/5 Quart – 86% Proof – Product of Scotland – Imported by Renfield Importers Ltd. Union, NJ – Blended and Bottled by Haig & Haig, Markinch, Scotland. Carton made and printed in Scotland ” – are written at the bottom of the box. The number 2897 along with the words Haig & Haig, Scotland and letters UG8 are molded at the bottom of the bottle. The bottle has a gold cap which appears to be metal. It has a red tax seal across the cap with the number 2141613561 on one side and Renfield Importers, Ltd. Union, NJ. on the other. The word VOIDED is stamped on the top of the seal. Also along the top of the seal Series 112. Close to the neck of the bottle there is a golden label with a coat of arms with two horses facing each other and a white cross between them. Below this coat of arms it says Product of Scotland. On each side of the coat of arms the word Pinch ( in red ) is written. Below one Pinch word it says By Haig & Haig, Blended Scotch Whiskey 4/5 Quart, Below the other word Pinch it says Blended and Bottled by Haig & Haig, Markinch Scotland, 100% Scotch Whiskey, 86% Proof. Towards the bottom of the bottle there is another golden label which says: Imported by Renfield Importers Ltd. Union, NJ. Distilled and Bottled in Scotland Under British Government Supervision. The word PINCH is printed in white on one side of the bottle and is wrapped in a wired netting. We would like to know more about the history and value of this bottle. II have a Dimple Royal Decanter, this in the original box and unopened. It was given to me in 1970’s. There has been scratched into the bottom H 1493. Does it have any value for a collector? Thanking you in advance for an answer. Can you please tell me the age and value? I just found that bottle in my grandfather house. I would like to know the age of the bottle and the price of it. The bottle is not oppen. Great query and especially so as we have not been asked that question before in this forum. Hello Barb, I was curious if you still have this, would you be interested in selling it and if so for what price? My family has a funny history with this scotch and would be a great addition. Hello Mike, I was curious if you still have this bottle? If so, would you be interested in selling it and for what price? My family has a funny history with this scotch. I am trying to locate a bottle for my parents. This bottle was purchased for my christening in 1942 but never opened. Hi Malcolm, Are you sure it wasn’t bought for your 10th birthday? The coat of arms is for the reigning queen (Queen Elizabeth 2) who was crowned in 1952. A bottle purchased in 42 would say His Majesty the King. Also, the gold cap would suggest post 1957. See http://www.haigwhisky.com/old-haig-whisky-expert-guide-aging-haig/ Hope I haven’t upset some family story!!! It is my understanding that gold foil caps were not introduced until 1957 so it is unlikely to have been purchased when you state. There were gold caps prior to World War 2 along with other colors from time to time. Gold was reintroduced after the war (around 1957) when aluminium supplies recovered. Hello I have in my possession a Dimple from the Allied Forces in World War II and I would like to know it’s value in the market. Hi Margo, I’d say that it’s quite a bit younger than you think as it says “Her Majesty” on the neck seal. This of course refers to Queen Elizabeth 2. It also mentions Markinch and has a gold foil cap. Have you read http://www.haigwhisky.com/old-haig-whisky-expert-guide-aging-haig/? Lots more clues there! This is mine, my parents have had it for over 30 years. Any ideas of age? It has Scotland molded into the bottle on the bottom. Hi Brian, What does it say under the royal coat of arms? Hi! I would like to know about (Haig’s Gold Label bottle) aging ,condition and it’s price. Thanks. I’ve inherited a bottle of Haig Gold Label. It’s Duty Free. Has a white metal cap. Has only Edinburgh written in the bottle. I’m trying to find out the age of the bottle….can you help? According to research I have a bottle from 52 to 57. I am trying to determine its value. It is unopened and seal appears to be good. Bottle is still full. Any help would be greatly appreciated. I have this bottle of gold label scotch whiskey. Can you tell me how old it is and is it worth anything . I plan one day to open it when i retire. I have a question more about the packaging of the whisky than the whisky itself. I live in South Africa and have an old wooden chest (I presume the straw packed wooden boxes from pre 1920 you referred to in your article). I would like to know more about the chest, especially its age more or less, as well as the name of the whisky engraved on it. The chest is 70mm x 42mm x 34mm. On the back is engraved John Haig & Co Ltd Markinch, and on the front GLE??? ?VEN (I cannot make out the whole name) Old Scotch WHISKY. The metal handles has Pat 2201 engraved on it. Could you maybe be of some help? Any thoughts on this bottle? How old it might be and if it’s worth like a million dollars? Bottom is molded and says “Haig&HaigLtd / Scotland”. It also has the spring type lock on top. While not opened it does appear to have evaporated a bit. Brad, did you ever find out the age? I found the identical bottle that my dad gave me years ago. Thanks! Good afternoon. I have an old PINCH bottle. The only printing on the bottle is the word “PINCH” and that is only on one dimple. Unfortunately, the bottle is empty. Would you be able to advise me of the age and possible history of this bottle please? The bottom of the bottle states HAIG & HAIG LTD along with the number 12. This was among my Father’s belongings when he passed a few years ago at 92 years of age. Any help is appreciated. Thank you in advance. Hello, my grand mother told me that this bottle of whiskey is dated from the second wold war when my grand father served at the Greek navy as an admiral and it was offered to him as a gift by the US counterpart. I am trying to find out it’s value and a possible date of distillery. Any kind of help will be well appreciated ! I have a bottle of haig dimple, I have read your page and great though it is I’m still not sure what I have. 70 proof with what looks like copper wire over the bottle like fence wire ? Any ideas of age and significance of the box? My bottle is metal capped but only has a reference to Markinch… I only see references in this article about Markinch & Edinburgh. Can you assist? Hello. I am getting married 28th December 2017. My believed grandfather will have passed almost 12 years by that point but I want to remember him in a special way. He loved Haig gold Label. Please advise of how best to get my husband to be a bottle for the special day. Price? I know it’s between 45 & 50 years old. Thanks for your trouble and time. I’m looking FoR some information about this Haig’s gold label bottle: aging, condition, an value. I have this bottle of Pinch. I read your column and can’t fined any names on seal of which Queen or king at the time it was made. There is only the word Pinch on bottle. Here is the picture of it. I have a bottle of bottle like this how old is it? I’m really hoping that you can help me. I have just bought a 1930s/1940s Haig Whiskey optic which I’m going to install in an garden bar. I’ve checked the fittings and I’m pleased to say that modern Haig whiskey bottles will fit it! I’d really like a framed picture to hang in the “bar”. I found this amazing Haig advert online which pictures the Statue of Liberty holding a bottle of Haig and Uncle Sam tipping his hat to her. Is this something that you have in your archives? Is so it possible that you could let me have an digital A4 copy? It’s from roughly the same period as the optic and they would look great together. Hi, I am looking to sell some whisky bottles we found when clearing out my grandads garage. We have; Haigs dimple (dated back to King George), and Haig Gold. We also have other whisky’s if you are interested. I have a bottle of boxed Haig Old Scotch Whisky with a competition label finishing in January 1986. I would be interested to know if it is drinkable and if it has a value. It has been stored standing up in a cupboard. Hi, I have this bottle but really I don’t know the year and I’m want to know if the price. Can you help me pleases ? How much ia a 50 year old one quart bottle of 86 proof, Pinch scotch. how much is my 50 year old one quart bottle of pinch scotch worth? I would say you are right about the date…circa 1925. I would not be too hopeful that the whisky would still be good. When the bottle is opened, you lose all the integrity of the original seal. Especially when its opened multiple times and then re-sealed. Even if it was stored perfectly, there is a good chance it will be spoiled. But you can certainly try! This bottle has the number 36-3934470 on the tax strip along with the State of Ohio Department of Liquor Control sticker with a 55E60343 number. Can anyone date this? Did you ever date this? I have exact bottle. I came across this bottle of Haigs dimple when I was clearing out the attic for a house move. I think I bought it about 40 years ago . It has a plastic top. The Number on the bottom of the bottle itself is looks like : SC750 followed by IL: HAIGS SCOTLAND then around the lower edge 16 and UO . There is also a number on the box itself: 045379. I wondered if you have the time to identify this bottle and give me an approximate value ? Hi , I have exactly the same bottle, did you get a price on it yet ? I have a question or two for you. I have recently acquired an empty blue coloured pottery Dimple bottle bearing the Dimple name and coat of arms in each of the three dimples and a leaf motif on each of the three corners all in gilt with gilt around the edge of the neck. Unfortunately the cork stopper/bottle top is missing. As I have never ever seen one of these before, I was wondering for what occasion this would have been made and when? Furthermore, would it be possible to purchase a replacement cork stopper? Here is another view. The bottom read John Haig & co ltd Scotland. The outside appears to be wrapped in leather (?) Or paper made to look like leather. The only marking is on the bottom. This is my cousin’s bottle. Do you know anything about it? Would you be able to let me know how old this bottle of Dimple is? Well, this past Saturday was a great day! Besides it being the last day of my forties, we finally opened a bottle of Haig which had been given to my grandfather in 1950. It sat in the basement of my Aunt’s house for most of that time, so no sunlight or very warm conditions. Seal was fully intact. I know it was from 1950 because my grandpa had written the date, in red crayon, on the label….which he was known to do (he also liked to mark the level in the liquor bottles so he knew none of the children were skimming any!). We were hoping for the best! We were not disappointed! Smooth, light and no bitterness at all. ~67 years did not have a detrimental effect it seems. Not only that, but my Grandfather passed away in 1958….9 years before I was born. So the sentiment of opening and enjoying the bottle that he himself had labeled and put away so long ago really touched me. What a great way to start my journey into my fifties! Hi, Stuart: I found a bottle from c. 1974 considering the metal cap. I opened it and tried it. My knowledge about the good taste of a whisky is very limited. So I’d like to know some criteria about the taste that this Haig should have. The bottle was perfectly closed and the colour is perfectly clean. I’ve found a grateful and strong level of alcohol in nose and mouth very long; the taste is sweet for a second; and a slight but evident smoke flavour… I’d appreciate your comments to guide my experience and realize how well conserved could be my Haig despite the time. Hi Richard, interesting bottle. Would need to see better pics. Please contact me at ewitz@comcast.net. Cheers. Sorry but somehow the neck picture had the top cropped during posting. Stuart, a friend found this bottle while cleaning out an old basement and knowing that I drink Scotch, he gave it to me. I am curious as to it’s age and thought it would be wise to find out if it had any real value before I drank it since it seems a waste to leave it in the bottle. I do notice that it has lost about 2 inches of volume. I assume this is from evaporation. I’ve attached a picture of the bottle and will follow with a close-up of the neck. From your examples in your “How Old” info, I would guess that this is a pre-war vintage but wanted to ask your opinion as well as your advice about any value. Obviously the labeling is not in perfect condition. Hello, I found this old bottle of Haig Blended Scotch Whisky and I believe that this bottle was one of those that belonged to Fidel Castro back in the day. I would like to know if it is true and how old this bottle is and what price of this bottle is. I have more photo so please let me know what do you think so we can have further communication on this subject. Have a nice day. Hello! My dad was given this bottle of Haig and Haig when I was a kid. My mother seems to think it was about 40 years ago when he received it. My dad passed away years ago. I was wondering if you could tell me anything about it. Thank you so much!! Matthew- Does your bottle have a spring cap? It is difficult to tell from the photo. If it does, we may have the same age bottle and I think mine is from the 1920’s. It has apparently been passed down in my family and the children of the deceased drink at their memorial service. My father just passed and he was 71 and I have it now as the oldest sibling. Hi, first time in here, can anyone help? Got this bottle as a gift, its at least 20-30 years old as i know, but dont know anything else. Can someone tell me more about the bottle and its value? Thank you! I have the same bottle, did anyone give you a value on it? Hi my family and I just went threw my grandpa’s stuff to get rid of it and we came a crossed a bottle of Haig whisky with the spring cap we know it’s old but we are curious as to what year it was bottled it’s a 4/5 quart bottle and 86.8 proof it has hand written # 28/440 so it suggested to me that they only bottled 440 bottles out of that batch any help would be awesome we are planning on drinking it at the next family reunion this summer with some great cigars. I have a bottle of Dimple Haig which was given to me in 1990. The bottle is clad in pewter also the cap. I have never opened it. I am wondering how old it is and is it a collector’s item? 1 bottle of scoth 1/2 gallon on stand some evaporation. Sealed. Can you date.? Interested in selling, can u direct me. Hi can you give some idea on this bottle of Haig Dimple Whisky, and whether it is safe to drink, I have checked for a date near the Royal seal but unable to find one. Since my bottle have a metal twist cap it should be from the 60´s or early 70´s but I do not find this type och label or type of bottle on any of my google searches. Is it possible to narrow it down to year or what decade this was bottled? Hello, Stuart. This Haig decanter has been in the family for a lot of years — empty, I’m afraid. Might you have any idea of its age? Thanks! Hi can give me some idea how old this bottle of 15 Year old Haig Whisky is please. I’m looking to find out the age of this bottle. If you could help that would be great! I’m unsure if it’s 1950s or 70s. Hi I don’t know if I’ m talking to Hannah or Stuart but I own the same bottle which I think I’d from the 50s not the 70s according to the foil cap ! Is this bottle of Haig & Haig Whiskey safe to drink? I suspect is from the 1940s, with a white foil cap cover and a spring closure. It was kept in a cool dark place it’s entire life. Please advise as to its exact age, value and quality. thank you. Please can you assist with how old the Haig set is in picture and what it would be worth. This is really a nice resource so first, thank you. I just found this unopened bottle and am wondering if I can get some better help dating it. Based on the article and that this only has “Edinburgh” on the bottle I know this is pre 1952. Also, I see the screw top was “introduced” in the 1920s, but does that mean this is a 1920s bottle or could it be from later? If anyone has a more exact dating of this I would appreciate it. Would like to know what we are going to drink before we do. Thanks. Same question as most on here! (sorry). My father passed away a few years ago and I found this bottle of Haig whiskey. I appreciate it is a good brand, but before I open it, I wondered if you could tell me any more – unfortunately it seems to have lost its label. I believe its Gold Label, but have not idea of age, or value. Shall I just open it and see what it tastes like? I’m looking to sell Pinch Haig & Haig bottles from the 1950’s and 1960’s and one from 1989. Trying to find interested parties. Please contact me if interested. Does anyone know how old this one is? Hello! I have two of these unopened collector bottles. Would you be able to provide me with a ballpark figure for their worth, if any? This bottle was recently given to me from my father-in-law. It was his fathers who passed 36 years ago. The bottle appears to be from the 1950’s but I’m not sure. Can you clarify its age by the picture below? I have attached a picture of the bottle and the box. I received it as a gift some years ago, but have no idea if it is still good or how old it is. I have an unopened bottle of Haig Dimple marked “Old Blended Scotch Whisky”. Short gold metallic covering (pewter?) with clip visible at the side. States by appointment to H M King George VI. Marked 70% proof and “Made in Scotland”. The bottom of the bottle states “Haig’s” with various other letters and numbers – A660; R8; UGB. Seems from the description guide you give that it may be post 1957 because of the gold foil, however by appointment to King George VI provides a conflict. I was given a huge bottle of Haig Blended Scotch Whisky that has been my grandfather’s. He is not with us anymore and I’m trying to figure out when it was bottled, what’s the volume, and what it could be worth. First, it’s stated “1×1/2 GALLON BOTTLE” on the box. What’s this in liters? I’ve tried hard to find out the age of the bottle but haven’t succeeded. I have uploaded images to https://www.dropbox.com/sh/1z0qwdxwb3yfc5w/AAC7WnQeyXQcfzGgJr4P-_daa?dl=0 so that you can have a look. Under the bottle, there is text that is pinched (if that means standing out). What could this be worth? Hi could you tell me the year of this bottle and of course how much it could be worth . It’s un opened . Kind regards paul. My dad recently passed on, he had a bottle of dimple, and as far as I can remember he has had this bottle for about 15 years. The bottle has a wooden and metal handle. Please can you help me with a value on this bottle and the age please. I have acquired a old bottle of Haig & Haig Pinch, I have reviewed the information contained on your site, however I am still having an issue in determining the age. I am trying to see if there is any value, or should I just enjoy it…… My husband is from Cork,, and he gets that wild glint in his eye when he sees this bottle. Not to sure, should I give in and crack the seal ? Help, I am running out of hiding places for the bottle. thanks………………….. I have an unopened pinch bottle of Haig & Haig Ltd. It has the spring cap & tax stamp seal unbroken. It also has an Illinois tax stamp. The bottle is embossed with Federal law forbids sale or re-use of this bottle just below the neck. The bottom is embossed with the words: Haig & Haig, Edinburgh, Scotland. The words Haig & Haig appear to have been painted in the pinch with a half moon shaped label below with the words: distilled in scotland and bottled in the united kingdom under government supervision. The neck label bears a coat of arms with wording on each side and below it. I have had the bottle all my life. It was on a shelf behind our bar in the basement of the house I grew up in. My father gave it to me when I married. He told me to open it when my son got married & drink his health. My son does not drink so the bottle has remained unopened. I will be 73 this month. My brother was born in 1941. There is some confusion whether my father received the bottle when he got married in 1924 or when my brother was born in 1941. The seal says: Somerset Importers, Ltd. New York, N.Y. on one side & has the numbers: 36-8543363 on the other side. The IL. tax stamp has the numbers: 234751 on it. I’d be interested to know how old this bottle actually is & if it has any real value. The level of the whiskey has gone down to half way below the “&” from evaporation as it’s always been stored upright. I’m not real computer literate so pictures are not easy for me. If you think it would help, I could get my granddaughter to help me take some. Would love to know a rough age to this small bottle of Haigs. From what you say I am assuming 1957 -1870? What would you suggest it’s worth? Should I hang on to it? Hi- I found this in my grandmother’s closet, I believe it to be post 1920 because of the top but it doesn’t identify it as Dimple or Pinch and it just says Edinburgh. There is no mention of Markinch whatsoever. Can you please tell me how old this could be? Did you ever find out? This one looks just like mine- the box too! Hi Stuart, I have a bottle of unopened Pinch, – Plastic cap with seal intact (Pinch), ( possibly 1970’s?) 4/5 quart, 86 proof. coat of arms 9 (no mention of King or Queen), only label on front is “This whisky is 12 years old”, Bottom of bottle – 1897, Haig & Haig Scotland “US”. Looking for value $$$. I got as a gift this bottle. Can you tell me how old is she? See attached..any insight ? I have more pictures if needed and some other interesting bottles..all found in a secret wall and dating from prohibition, but very curious if you might be able to date this bottle. Thanks in advance for any insight. Do you still have the bottle, and is it full? Do you have other bottles as well? My photos and comments seem to be back. I have another question to add. Notice the silver running down the side of the bottle is not carved with patterns like all other Haig bottles. Why do you think that is? Could this be a prototype? Or unfinished? The current Chief of the St. Andrews Society in Mexico (Scottish Organization), really wants me to donate this to them since it was given to their new Chief, William A. Kennedy in Jan of 1950. I’d really like to know what your opinion of this bottle is. Thanks so much. I thought of something else. Has anyone ever seen a top with a flower like this? All the ones I have seen online are plain. Is this a unique design? I’ve never seen a silver pattern like this. Any ideas on age, value, etc? It’s stamped .925 on the bottom. I can’t post a picture for some reason but I did post a link to a picture of the bottle on flicker in the website section. I would appreciate a reply, hopefully soon, as I’m eager to drink the whisky but I dont want to without the knowledge to appreciate what I’m drinking. when you still have the full box I would be interested in them. Hello, I have a bottle of a certain Haig whisky, but unfortunately it doesn’t have a label anymore – I took a couple of pics that could maybe help determine its age and type. I would like to ask if you could tell me about a John hair & company bottle we came across here in Canada. Hello I have been shown this by a family member and I’m looking to find out some information on it. Hi, It is a HAIG 4.54 LT Bottle bought from Germany in 1976 by my father. What could be the value of it. Hi, i am not sure what i have here, i was given this, i would guess in the late 70’s in UK, box was gold, dusty and not in good condition, un-opened, any light you could shed would be nice to know, Thanks. Stuart, could you place a value on the bottle for me ? thank you for your knowledge . We have found a 2.27l bottle of Haig Blended Scotch Whisky Gold Label. It has the same label on the front and back but the back one is upside down which makes us think it might have been meant for a pub? It is unopened and the seal is white plastic. There is a reference to the Queen in the Royal Coat of Arms. Hi, I have a royal holland pewter dimple haig empty bottle. B1568 is scratched underneath next to stamp that bears Royal Holland Pewter Dralderop. I would like to sell it, would you mind giving mne the value and where to advertise best. I have been offered a bottle like Gail’s and it is in a brown box no815357. My son collects whisky and I would like to buy it for his collection but I don’t want to offer under the value for it as it is from a friend. Could you help me please. Any I dear what these are worth..
Found this bottle in my basement and wanted to know how old it may be and what it would possibly sell for? Here is my second photo of the handle. Thank you for any information. Thanks so much for your informative website. My pinch bottle appears to be stamped on the neck “4-1-89” — so can I take this in the literal sense of being tax stamped on April Fool’s Day 1989? Not sure if that is the import date or some other code. Also mine has a carrying handle (I will post a second photo) — is that common? Hi, I have just been given a bottle of Haig 12 year old Dimple for Christmas. It is in a gold coloured box marked Dimple Deluxe Scotch Whiskey, 75cl 40% vol. Other markings on the box state 132/140. 50 00212 00111 1. The box lid has a red seal type logo with what looks like two unicorns either side of a shield. Can you oblige and send me any information as to how old this whisky may be? We just moved our 87 year old Aunt into a nursing home and found an unopened bottle of Haig & Haig Pinch in her pantry. It has gold foil wrapper, spring cap and only has Markinch on label/box. I can’t locate the coat of arms online so at a loss to know what it might be worth and age. Would you be able to give us a ball park on what it might be worth and where I can sell it? Mark did you ever find out what this bottle was worth. I found a bottle at my mom’s house as well. Hi all, I have an old bottle of Dimple that i need help ageing, From the outlines from this site, it seems fairly old but some pointers don’t quite match up. Here are some photos – perhaps you guys can help! There is also a photo attached. What do you think about this bottle? How much would it be valued at? It has never been open. Hi Stuart, we have a small boxed unopened bottle of Haig which we think is the 1960’s to 1970’s as it has a screw top. The original price is written in pencil on the top – 4/10 which I’m assuming is 4 shillings & 10 pence so likely to be before decimalisation. This bottle belonged to our dear departed aunt but would love to know for sure when it ages from. No amount content on the bottle, Certainly more than the miniature size we have now a days, perhaps a quarter or an eight size? Again something we would love to know. It carries an excellent slogan – don’t be Vague ask for Haig! Many thanks. I’m from Portugal and I am trying to find out the age of my two bottles of scotch and also the approximate value for both. Could you help me on that? Thanks in advance. Luís. Any idea if this bottle is worth something ? Merry Christmas. My mother in law has a pair of miniatures that were given to her grandparents by a friend. Unsure of the year, but well over 50 years ago. (photo attached) The bottoms are stamped with unique numbers – UCB 11619 and UCB 11621. Very curious as to age. (and value, if any). Thank you. Not sure if you get a hi-res image and can see that the label reads By Special Appointment to HM The King. But, another label appears to mention Markinch. It’s a spring top with Gold Foil(?). So, I’m confused as to the time frame, based on the clues from the guide above. I have additional photos if needed. I have an old Haig pinch bottle (empty) that is decorated with sterling silver. It is stamped 1925, Mexico on the silver. It has Haig on the bottom in raised glass and A66. Haig’s is stamped in white on the side. The top in dented but the cork is intact as is the silver covering the bottle. What is the value of this bottle and how best can I sell it? I’ve had this bottle in a cupboard for the last 9 years since it was discovered in a house under restoration. It’s unopened and as can be seen the label is a bit on the tatty side. Being fond of a tipple myself I’ve never been sure that it is still safe to drink. As the bottle has haig moulded into its bottom and the fact that it is in fluid ounces I wondered how old it might be and if it is of any value to a collector. Got this bootle from my grandmothers pub. It was their when she move in in 1951 . It’s never been opened and label has come off neck. It’s a spring top . Do you have any ideas about it. sorry, I hit submit in error. I am just looking for any information on this, He probably got this at least 30 maybe 40 years ago if I had to guess. Hi, I am hoping that you can help me. My Dad gave me this bottle of Pinch Whiskey. I have tried to research it and can fine similar bottles, but nothing with the exact wording on it. Mine does not say the Proof on it, or the bottle size. As you can see in the picture is says 25 fl Oz. Just wonder if you can shed any light on the age of it or any other details. Hi Stuart after reading through your descriptions we seem to have a rare bottle with both Markinch and Edinburgh. Can you advise us where we may look for a buyer? Thankyou for your very informative articles. Hi there, I’ve had this bottle of Dimple in the cupboard for quite a while now. Used to belong to a friend’s grandpa who’s since passed away. I think it might be from the 70s – it’s a German import, so I don’t know whether that makes any difference? Any idea how much it might be worth? I attach further images below. Cheers! Hi Stuart, I wish that I owned a bottle of this fine scotch, but instead I just received a Haig & Haig Pinch wood crate. Wood you know the approximate date range? It is approximately 18″ wide x 15″ deep and 9″ tall. The printing is in good condition on three sides of the crate. I have no need for it, but if it is from around the WWII era, I will keep it. If not, I hate to just throw it out. Is there any value to these crates? I would like to know if you know anything about this – it has the haig label and is very heavy. I am not sure if its some kind of promotional bottle, or a paperweight or real. would love to know. I had a buddy of mine give me this a few years ago. I’m intrigued by the history behind these bottles, and you are the expert. Any info would be appreciated. I couldn’t figure out how to add multiple pics so I’m going to try and add more following this post. Thank you in advance. A Treasure from my Fathers Cellar, what years was the label painted “Haig & Haig”? Haig and Haig were a US Export focused subsidiary of Haig Whisky in Scotland. Haig and Haig was established in 1888 by Mr. John Alicius Haig who was a brother of Hugh Veitch Haig, the first chairman of John Haig and Co. John Haig and Co. was the name given to the Haig Whisky “Family” business after it was floated as a limited company registered in Edinburgh in 1894. Haig and Haig developed a sizable export business in the USA until it was bought (along with many other small Scotch whiskey companies by the Distilling Company in 1923 during the big Scotch Whisky consolidation at that time. For more info on this see my article on protecting Irish Whiskey at http://irishwhiskey.com/protecting-irish-whiskey/ . The Distillers’ Company then positioned Haig and Haig as a fully owned subsidiary of the Main John Haig and Co in 1925. Unfortunately, the new incarnation of Haig and Haig then remained dormant until 1933 after the introduction of prohibition in the USA. 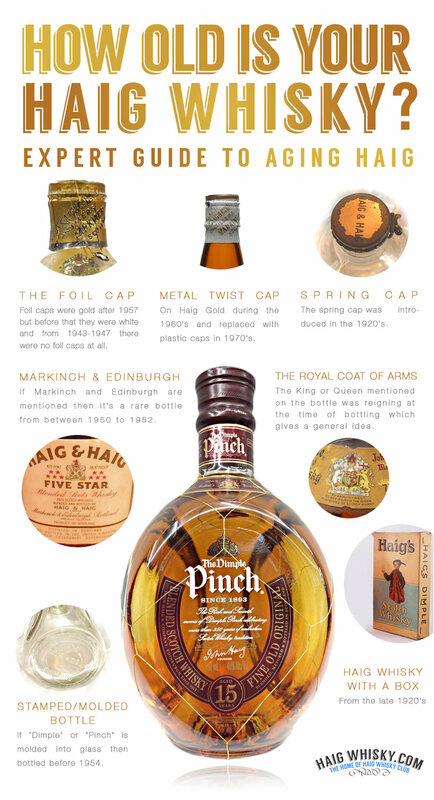 From then on, Haig and Haig regained momentum and continued to market Haig Pinch and Haig Gold Whisky in the USA until the late 1970’s when the Haig Whisky brand fizzled and died after passing from one multinational to another. Good afternoon Stuart, I have recently received a bottle of 12 yo Dimple from a friend who received it from his grand father. It has a plastic screw cap, but what triggers me is the label “British Customs Certificate of Origin No. 5” which holds a date of “18/2/74”, does this mean this is a 1974 bottle? Can you help me trying to age this bottle, and give some indication of what this would be worth? Any idea if this bottle (see link above) is worth something ? I recently deceased relative had in his basement a bottle of Haig Pinch that bears the brands “not for re-sale” and “for U.S. forces only”. It has a gold seal, and was packed in a cardboard box that reads “Haig &Haig”. Was stored with wines dating to 1959. Any idea how this came to be or when? Liqueur Scots Whisky Help Needed. Have an older bottle of unopened LSW Five Star that has been passed around for a long time. Story I got is that Henry Ford gave it to his dentist as a gift and then worked its way around our family for a while. I would like to know what value this may have and how to possibly get it into the hands of someone who may appreciate it more. Thank you for taking your time to help everyone out. I recently bought a bottle of Haig’s (in Australia) with very limited info on it. I suspect there has been some label of sorts that must have fallen off. Itsa triangular bottle and it just says HAIG’S. Thats it. It has a spring cap and it is moulded. Underneath the stamp reads A660 R3 HAIG’S U66. Would you have any idea what type og Haig’s it is, age and yout opinion on price? The approximate sale price of a perfect bottle with box and labels intact as in the photo that I have attached would be in the region of €200 to €250. Auction houses however will generally only offer you 20% to 30% of the final sale price. What can you tell me about this bottle? Hi, The photo is quite small so in general, It looks like a bottle of Haig Pinch. Haig and Haig were an offshoot company of Haig Whisky Scotland who looked after sales of Haig whisky in the USA. Haig Pinch was the US export version of Haig Dimple. Does the bottle have any moldings in the glass referring to Federal Law and Resale? Hi Folks, I know that many of you often ask me to engage in email correspondence about your old bottles of Haig Whisky. You also ask can you email me photos of your old Haig bottles. You may have wondered why I try to keep all correspondence about old Haig bottles here on the site. The reason is that this website is a non commercial hobby site and I have a very busy real life away from here which means I am often traveling abroad and away from home for long periods. It may also explain why I sometimes don’t get to answer all the questions that are asked here. I don’t share my private email address as I would be swamped with requests. If all questions are answered here, it means that every one benefits from the answers and they become a publicly searchable database for old Haig Whisky. Thank you for your information. There is no white lettering that says pinch on it. It does have a silver almost cone shaped top that holds the cork. The overlay that encases the bottle is very ornate. The design has people and flowers etc. Almost that of Asian decent to me. We’re there other manufacturers of a similar bottle during that time period? I have a bottle that says Markinch and Edinburgh on it and a White Foil Cap. It was given to me by my grandfather. Any thoughts on the value? I forgot to mention that the bottle is unopened. Hi Colin, The White Foil would suggest Pre 1957 and not the war years of 1940 to 45 as foil discontinued to save aluminum for the war effort. Hi Sean, What a great story. Thank you so much for sharing. I know Kells well. A great Historical Town. The whiskey will not have aged in the bottle so it is still 12 Year old whisky. Old whiskey like this should always be stored vertically to avoid seepage. Whisky corks are stoppers while wine corks are seals. That’s why Wine is stored on its side and why whisky can seep if laid down on it’s side. Is it safe to drink? It should be once it has not been contaminated by external sources. Common sense is the name of the game. As always, my advice is to drink and enjoy rather than sell. Old Haig Whisky Bottles like this may fetch a few hundred dollars but the memories of sharing such a rare whisky on a special family occasion will be priceless. And the empty or half empty Haig Whisky bottle will become a much loved family keepsake, all the more so when you add the experience of opening and drinking it to the bottles history. Have a great anniversary Sean! I have a un-opened bottle from my 74 year old father-in-law that was purchased for him by his father for his 21st birthday. He wants to drink some for his 75th. Unless it worth selling he doesn’t really need money but a story to pass down. Gold foil capped. Any idea as to the collector value to pass it on to his grand kids who are 21 now. I have what I believe is a Haig Pinch Bottle from the 30’s. It has a silver overlay that completely encased the bottle. I would like to know more about it and possibly a value. If you would like pictures let me know. Any information would be appreciated. Please can you help. I have a 2l bottle of Haig Whiskey which I know to be between 40 and 60 years old. Seal is unbroken and is taped across the lid of the bottle. The bottle is full. It was bottled by Markinch Scotland and bears Her Majesty’s coat of arms. The bottle has a gold plastic (it appears) screw lid with a 5 star bottle neck label stating that it has a built in pourer. The box is white with red squares printed on and the print letters are black. The packaging also bears Her Majesties coat of arms. The bottle has an indentation for easy grip when pouring. I would really appreciate a valuation on this bottle as I am looking to sell it. Good day from the Antipodes! My father has found his Bottle of “Haig Fine Old Whisky” which he has had in storage for at least 35+ years. It is a standard shaped bottle with a white metal screw cap. In a white box with background yellow-gold coat of arms. Label on bottle is a yellow rectangle with a fine Gold border, and Haig in bold red print. Any help on aging this bottle appreciated! Perhaps it is an Australian-specific bottling? I have just come in possession of a miniature bottle of Haig Dimple with the foil spring cap. On checking the lower label it differs from others in my collection. The difference is the 70°Proof is replace with British European Airways Corporation in small print. Can you shed any light on when these were produced and in what quantities and if they are collectable and of any value ? I have a spring cap with with Glasgow & London on the label. Any idea of the age or history? Hey, I was wondering if you could tell me what year and how much this old bottle of Haig Whisky would be valued at. I have got a John Haig fine old scotch whisky with Markinch and Scotland on it. It’s 4.5l on a cradle, the cap is only plastic. It has by appointment to her majesty the queen, purveyors of scotch whiskey and also down the bottom gold metals and decorations. I hope I have given you enough information as I couldn’t find good information on old Haig Whisky anywhere else. Do you know any information on this? kind regards, Sarah. my older brother as we determined what to do with what was there and coming across an empty Pinch bottle. I looked for this brand off an on over the years but never finding a bottle, but to be truthful not looking too hard. I believe I saw this brand mentioned in “Whisky Advocate” magazine recently as well. Yesterday I came across a bottle in a new-to-me liquor store. There it was, dusty, all by itself on a top shelf way above eye level. The minute I saw it I claimed it and had the clerk dust it off. I have no idea how old it is. It has the maroon seal at the top with the words “The Dimple Pinch” and the words Diageo with a 1.800 number. Whatever. I enjoyed your information on this website very much. You brought home many fine memories. I will be sure to advise my older brother of my “Find” and at some proper point in time open the bottle with him and share some memories. I still have the original box. The bottle has a spring cap wrapped in a gold foil. The foil is wrapped by a typed label saying “The whisky contained in this bottle is the product of the finest distilleries in Scotland specially selected HAIG & HAIG LTD.” The only other label is the one with the coat of arms. It is a blue shield with a white “X”, framed by upright white horses. Above the shield is a small ribbon with a red animal of some kind above it. There are no mentions of a King or Queen. It is the same image as the coat of arms above the “FIVE STAR” in your Markinch & EdinBurgh circular picture above. The left of the label has (separate lines in new quotes) “Contents 26 1/2 ozs” followed by “PINCH” “Finest” “Blended” “Scots Whisky”. The right of the label has “Made in Scotland” “Blended and Bottled by” “Haig & Haig Ltd.” “MARKINCH” “SCOTLAND”. The bottle has White lettering on the front dimple only, “HAIG & HAIG” above and “PINCH” below. A wire mesh surrounds the bottle. Any help dating this bottle would be appreciated. Im from Glenrothes next to Markinch in Fife and I’m aware of the connection with the town, I have just purchased a half US gallon bottle of dimple 12 years old with Markinch on the label it is boxed and has a wire decanter around the bottle….any idea of the value please i presume the whisky must be nearly 50 years old? Hi Stuart, I have come across an old bottle of Dimple and just wanted to know if you could put a value on it. To help you it is 70% proof 26 2/3 fluid ozs. The Coat of Arms references Queen Elizabeth ll era and only Markinch is mentioned on the label. The bottle remains unopened and is in excellent condition. Thank you in advance for any help you could offer. The label on the neck of the bottle has the word ” markinch ” in capitals at the bottom of the label. Is there a value for this miniature? Hi Adrian, Then it is post 1952. I’ve seen these for sale on the likes of Master of Malt and the Whisky Exchange for about £50. However, they may only have paid someone like yourself half of this price as they also have to make a profit when they sell it. I have a Dimple Haig’s Miniature with a buff colored box. The gold wire is intact. The bottle is unopened. There is a label around the neck, one on the crown and one in a dimple. The label in the dimple and the box show 70% proof. There is a spring top cap. How old is my miniature? My unopened bottle does have a stamp on the bottom, and on the front label it has an 8 digit number. ? Would the number help aging the bottle?